I got AC IV recently and fired up my remote play on the Vita to give it a try there. Read on to find out how it works. By now you've read the reviews on Assassin's Creed IV and heard the good news. Rave reviews on most sites, and an 88 on Metacritic. I've played about 5 hours and am happy with what I see. The PS4 version is beautiful. 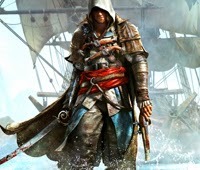 The controls are great, the characters are fun, and hey... Pirates ashore and on the open seas. We all win. I've found that I do what I did when I played AC2. Before I follow the main story line, I find all the chests and bonus things on each map. It gets me better acquainted with the map so when I do the missions I don't feel all lost. Kind of like I scoped the place out to make a quick escape if I need to. Plus, you open all the fast travel points when you synchronize the viewpoints, which makes getting around even easier. Ubisoft does a nice job of telling the player how the buttons are working on the Vita. Check out the image below to see how it works. You use R2 all the time to run and free climb, so it makes sense that the right trigger button on the Vita was intentionally programmed to do that function. Smart thinking Ubisoft! Well thought out controls and instantly lets users know what they are. Thanks! 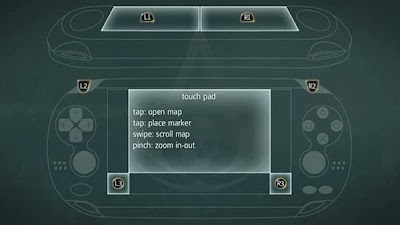 To get the map, you just tap the touchscreen and you can scan the map by sliding your finger around, set waypoints, etc. The slide function is backwards, it feels like. It doesn't feel natural, but you get used to it. This part is confusing and a real let down for Vita owners. When you get your first treasure map when playing on the PS4 a screen pops up to tell you you can use a second screen to access maps and various cool sounding activities. However, when you fire up your Vita with the Second Screen option, you find out it doesn't work like you hoped. In fact, it doesn't work at all. 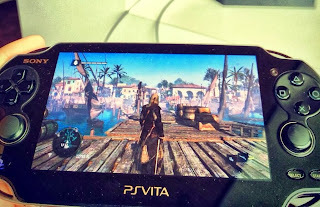 There is apparently a ACIV app for mobile devices BESIDES the Vita. Calling it "second screen" is misleading. Hopefully there will be an update for this to get a Vita app. (I'd like to see this updated for when Watch_Dogs comes out... that second screen option looks cool). "You've got a bug on you." Wow! When you first fire up the Remote Play with this title you will marvel at the colors on the OLED screen, the fluid wall running and leaping about, and basically a seamless transition from PS4 to PS Vita. I didn't get the opportunity to play at a distance but only through local Wifi. (My router still has connectivity issues.. not a prob with the system, just my own set up). Excellent. 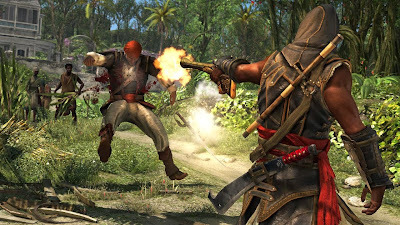 Ubisoft makes it easy for Vita owners to transition their pirating seamlessly from the PS4 to their handhelds. - Second screen should be utilized on the Vita! What a missed opportunity! Have you played this on your Vita yet? Have any other things you want to know about Remote Play for this game? Let us know below!